They're Back! The Periodical Cicadas Have Arrived! Yay! Right on time! The adults of Brood III of the periodical cicada have emerged. 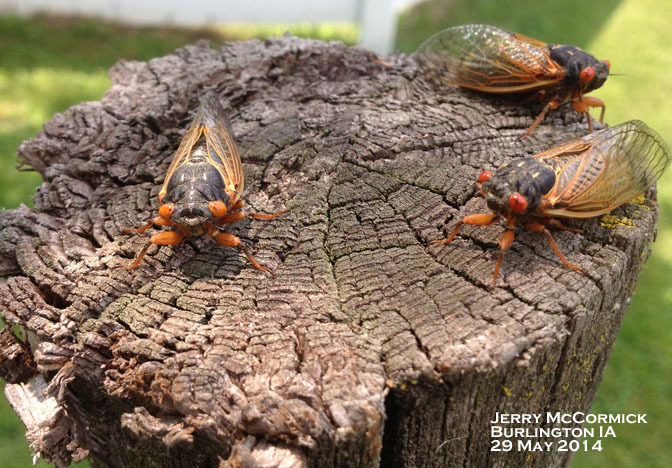 On Thursday, May 29 I received my first reported observation of periodical cicadas in 2014. A caller from northern Des Moines County phoned to ask about 1-inch long, red-eyed, black insects in his garden. Periodical cicadas at last. I have waited 17 years for this call. 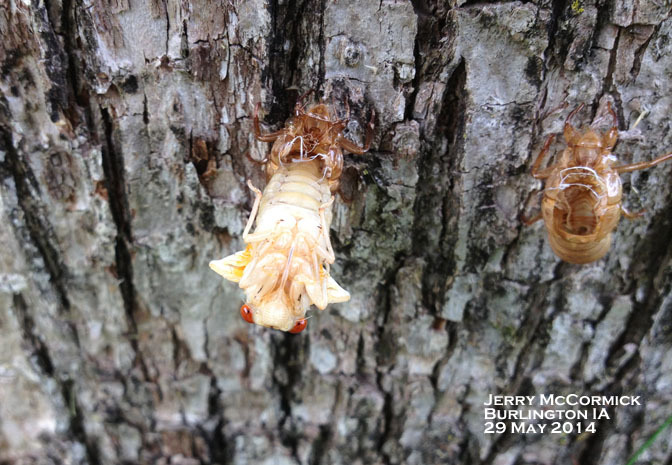 Since the initial report we have heard from others where "a few" cicadas have emerged. With temperatures in the 80s this week, more will be coming and reports will come from more locations. At the moment we have had reports from Warren, Decatur, Wapello and Madison Counties. We are anxious to hear from the rest of you! For more about the periodical cicadas see the HHPN from April 11, 2014 and the ISU News Service release from May 30, 2014. See below for photos of "new" cicadas from this year! An emerging periodical cicada. Note the empty shells nearby on the tree trunk. At the peak of emergence, some trees will be a solid mass of "shells." Strawberry Root Weevils-- They're Back! Periodical Cicada Flagging- The End is Near!